What are Windows desktop gadgets or Windows Sidebar? 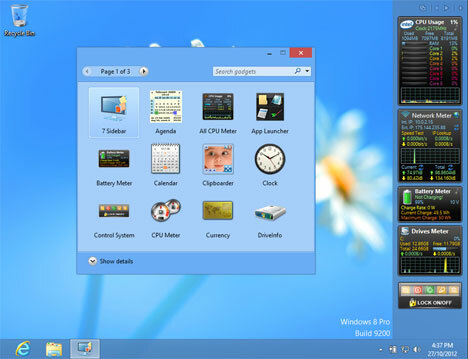 Windows desktop gadgets is a long and vertical bar that's shown on the side of the desktop computer. It contains a small program called gadgets, that provide a method to manage the info you need to access quickly, without clutter your work area and also that will display continuously updated information and let you to perform common tasks without having to open a window. It's only support Windows 7 and Windows Vista. For the Windows 8 you have to install 3rd party software called 8GadgetPack. Why use Windows desktop gadgets? Windows desktop gadgets can continuously updated information. For example, you can monitor earthquakes around the world right next to your desktop. In this way, if you wish to keep an eye on what's going on in the earthquake news while you work, you don't need to stop whatever you are doing to switch to another website or close your document, because the Earthquake Meter are always visible. Are Windows desktop gadgets safe?